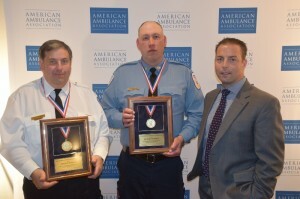 Every year, the American Ambulance Association hosts a three day Stars of Life Awards Ceremony celebrating the most dedicated employees in the industry. EMS professionals from all over the nation come together in Washington D.C. to participate in a series of celebratory and educational events. Award recipients can come from any area of the industry, but must be exemplary representations of leadership, teamwork and professionalism. they felt best demonstrated the qualities associated with Stars of Life. The number of responses was overwhelming, however, two individuals stood out as front runners; Chair Car Supervisor Enrico ‘Rick’ Scimemi and EMT Joseph Johnson. Both men are consistently commended by both their peers and our partner facilities for their excellent teamwork, innovative solutions and overall customer service. In turn, Rick and Joe were selected as Armstrong Ambulance’s recipients of the 2016 Stars of Life award. In early April, Rick, Joe and Armstrong’s CEO, Rich Raymond traveled to Washington, DC. They, along with state legislators, honored the incredible men and women of EMS and shared in the gratitude of those that they help every day. We are so proud of Rick and Joe for their respective awards and for the work they’ve done that led them to this prestigious honor.